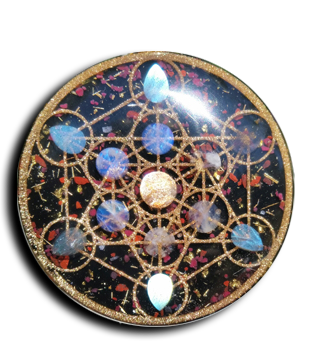 This is Merkaba Light Vehicle Charging Plate (13″) with 7 double terminated Quartz crystals arranged in a grid around the center. It is cast with Gold Leaf and Glow, Steel and Brass shavings with 7 double terminated quartz crystals. Inlaid with Red Jasper, Noble Shungite, Carnelian, Calcite, Citrine, Peacock Ore and Galena.